Break up with coffee, for green tea. Yeah, that’s a good one! Some people know about my ‘adoration’ for the delectably delicious roasted nectar of the coffee bean… I’ve written about it before – it’s more than the luxuriously rich, nutty, earthy flavour and aroma, admittedly, it’s also about the jolt! There are days, especially on the weekends, when the thought of a perfectly brewed triple americano (canadese, as it’s sometimes called here in Canada) is the reason I spring out of bed. And that first sip, what can I say – it’s, well, nothing short of magical! So, what happens when a buddy of mine, a health guru of sorts, challenges me to give up my morning cup of black gold, for a tepid cup of pale green tea? Sometimes, timing is everything. I’d actually been thinking about aborting my daily coffee routine for a little while now. I go through this process at some point once every year. I realize that I can’t go a day without a cup, without getting a terrible headache that Advil has no governance over, and I say to myself, ‘I need to get off this stuff.’ Then set out to break it off, cold turkey! I simply stop, and suffer through 3-4 days of headaches and irritability, before the fever breaks. I always go running back because I miss so many things about it – the taste, the smell, just going into a coffee shop and hangin’ out. There is just so much to love, you see. Nevertheless, I just broke it off again last week. What had once seemed so shiny and new, has somehow faded and suddenly looks dull in my relationship with coffee. Caffeine can be a cruel, cruel mistress. Most days I’ve been left feeling jittery, and sort of ‘dried out’, for lack of a better word. It’s also been wreaking havoc with my attempt to stay hydrated for my training rides and weekly races… I needed out. I mentioned this to my buddy Tyler, who drinks green tea with the same fervor that I used to drink my coffee. He comes into the office each morning, and carefully brews a personal-sized Bodum of special, loose-leaf green tea that he brought back from his most recent trip to China. The light bulb went off! Of course! Breaking it off with coffee would be easy if I didn’t need to go through the painful withdrawal. BUT, green tea? That’s not even like switching to regular, proper English tea, which is still dark and flavourful. I couldn’t exactly see myself jumping out of bed in the morning to get at my tepid cup of pale, tasteless green tea! 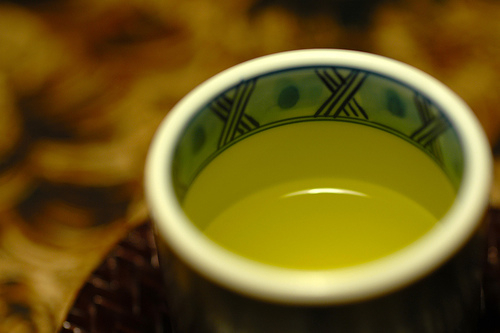 (Yes, properly brewed green tea doesn’t use boiling water.) 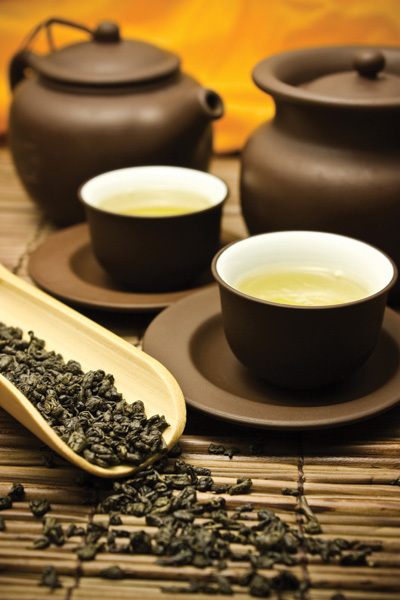 On the other hand though, some of the more well-known health claims for green tea are that it is an anti-oxidant which helps prevent certain types of cancer and heart disease, and also increases your metabolism and helps burn fat. So, with those reasons combined with the drastically lower levels of caffeine I was looking for, I figured I’d at least give it a go. No more coffee. Green tea here I come! In the meantime, here is a quick breakdown of Pros and Cons, as I see them. You can link here to the post Tyler wrote on green tea, which includes info on the history, and even proper brewing techniques. Green tea is a much healthier choice of caffeine ‘administration’, than say, coffee, so if you’re looking to make a small health/diet change for the better, green tea just might be your ticket. Sheldon, I am SO with you. I go through the same thing every six months or so… realizing I’m way too addicted to my daily latte and wanting to move on to something healthier… but it’s so hard. (Especially with a toddler who doesn’t sleep or nap well!) Anyway, this has inspired me to try green tea again. I bet preparing it correctly makes all the difference. I just don’t want to be a slave to espresso anymore, I want to be free! :-) I’ll keep you posted. The way you wrote that makes it sound like a very tough break-up indeed. Nice work making the switch… I kind of thought you would be all talk. I think you nailed the differences between green tea and coffee perfectly. They are different animals – but green tea really is a brilliant drink. Congrats, Sheldon! Kicking any addiction is a difficult one. I hope you can stick with the green tea. I too have done a lot of research on most of the popular suppliments and there is no shortage of material on the benefits green tea. Fish oil is the only other suppliment (that I have researched) that has as many proven health benefits. I lament the assault on my rich, dark, nutty……..sigh! But, where is the compilation of reasons for exiling this beloved java from your daily routine in the first place? Yes, the list of pros of drinking green tea is formidable, but coffee is also well documented in the anti-oxidant arena…not to mention in areas such as diabetes risk, Parkinson’s disease, colon cancer etc. If the requirement is to continue consuming caffeine, just less of it, let’s take a hack to that “Triple”. Please don’t rob Peter to pay Paul…especially when Peter is much more amusing. I’ve written a bit on coffee and the benefits before in a post titled ‘Coffee – An Athlete’s Edge’, as it relates to fitness, and it certainly does come with its own inventory of unique and redeemable qualities, one of which is potentially staving off Alzheimer’s. I suppose like with most things in life, moderation is the key, whether you’re ordering a cappucco, or a green tea. Excess is the real issue, not necessarily the beverage itself and in my case my enjoyment of coffee really has overcome my restraint. With that in mind, my decision to exchange coffee for green tea comes from the ROI. Both are beneficial to your health in their own ways, but in an effort to buck a vise, green tea has more of what I’m looking for in way of caffeine content. I drink a small (refillable) cup of coffee for most people (same size as the small at Second Cup) with breakfast, then green tea with lunch. Coffee has plenty of health benefits, and I like to enjoy both in moderation :). You’re not the only one who has said they do that. I like the idea, and I may give it a try later on. I also made the switch to green tea. For me there is also a financial incentive for drinking green tea in place of coffee. I got hooked on a certain coffee shop that is an 8 mile drive round trip from my home. I’ve been driving 2,912 miles per year just to get my two cups of coffee a day. Also, I have been spending $728 dollars per year on two cups of coffee per day. Plus the wear and tear on my car, well you get the point. I now brew green tea at home with filtered water. Other benefits are that I’m saving gas and the environment. Green tea is healthy for me and oh, no more coffee breath. Best to you. Another thing that I don’t think was mentioned was that green tea you don’t need to add any cream or sugar. That’s what I need to enjoy coffee and it adds up. I use a little stevia to sweeten the tea. Enjoyed the article, thanks.